“All it takes is one mosquito to transmit heartworms to your cat - and just a few heartworms can lead to severe signs, possibly death,” explains Zach Mills, DVM Head of U.S. Pet Veterinary Professional Services at Boehringer Ingelheim. "Now cat owners have a new option to protect their cats." Heartworm disease is a serious and potentially fatal disease that can affect dogs, cats, and other animals. The risk of heartworms is widespread in the U.S. Heartworms are transmitted by infected mosquitoes. Mosquitoes become infected with heartworm microfilariae while taking a blood meal from an infected dog and then can transmit the heartworms to cats. Once in the cat, heartworm larvae develop in the cat’s tissues and then migrate to the bloodstream. They reach the blood vessels of the heart and lungs in a few months. Even indoor cats are at risk of exposure to these parasites. According to the American Heartworm Society, 1 in 4 cats diagnosed with heartworm disease is indoor-only pets1. “Some cat owners may assume that their indoor cat will not be exposed to heartworm disease or harmful intestinal parasites. In reality, even indoor cats are at risk of exposure to these parasites,” Mills added. View Centragard Drug Facts Sheet. To apply CENTRAGARD pull back the plunger of the unit applicator slightly and remove the cap. Part the hair in one spot on the midline of the neck between the base of the skull and the shoulder blades, place the tip of the unit applicator on the skin and apply the contents directly on the skin. If the weight of the cat requires a second application, apply the contents in the same manner as described above in the same location. Discard applicator after use. Heartworm Prevention: For prevention of heartworm disease, CENTRAGARD should be administered once a month. CENTRAGARD may be administered year-round or at a minimum, should start 1 month before the cat’s first expected exposure to mosquitoes and continuing at monthly intervals until at least one month after the cat’s last exposure to mosquitoes. 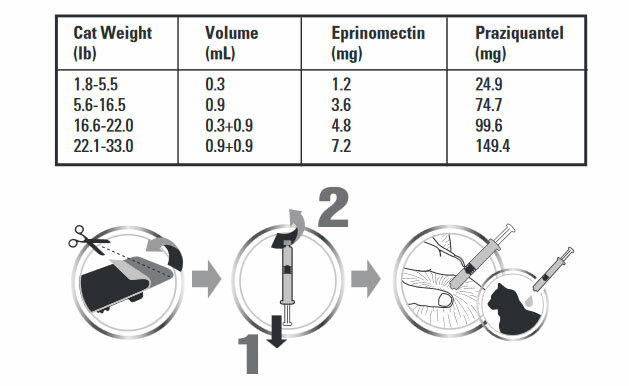 If a dose is missed and a 30-day interval between doses is exceeded, administer CENTRAGARD immediately and resume the monthly dosing schedule. When replacing another monthly heartworm preventive product in a heartworm prevention program, the first treatment with CENTRAGARD should be given within one month of the last dose of the former medication. At the discretion of the veterinarian, cats older than 6 months of age may be tested to determine the presence of existing heartworm infection before treatment with CENTRAGARD. Treatment and Control of Roundworms, Hookworms and Tapeworms: CENTRAGARD treats and controls roundworms (adult and fourth stage larval Toxocara Cati), hookworms (adult and fourth stage larval Ancylostoma tubaeformae, adult Ancylostoma braziliense), and tapeworms (adult Dipylidium caninum and Echinococcus multilocularis) after a single administration or when given monthly as part of a heartworm prevention program. Cats may be exposed to and can become infected with roundworms, hookworms, and tapeworms throughout the year, regardless of season or climate. Clients should be advised of appropriate measures to prevent reinfection of their cat with intestinal parasites. Because the prepatent period for E. multilocularis may be as short as 26 days, cats treated at the labeled monthly intervals may become reinfected and shed eggs between treatments. Human Warning: Not for human use. Keep out of reach of children. Avoid contact with the application site for 5 hours following treatment. Wash hands after administering the product. If the product accidentally gets into the eyes, flush thoroughly with water. In case of accidental ingestion, or if skin or eye irritation occurs, contact a poison control center or physician for treatment advice. 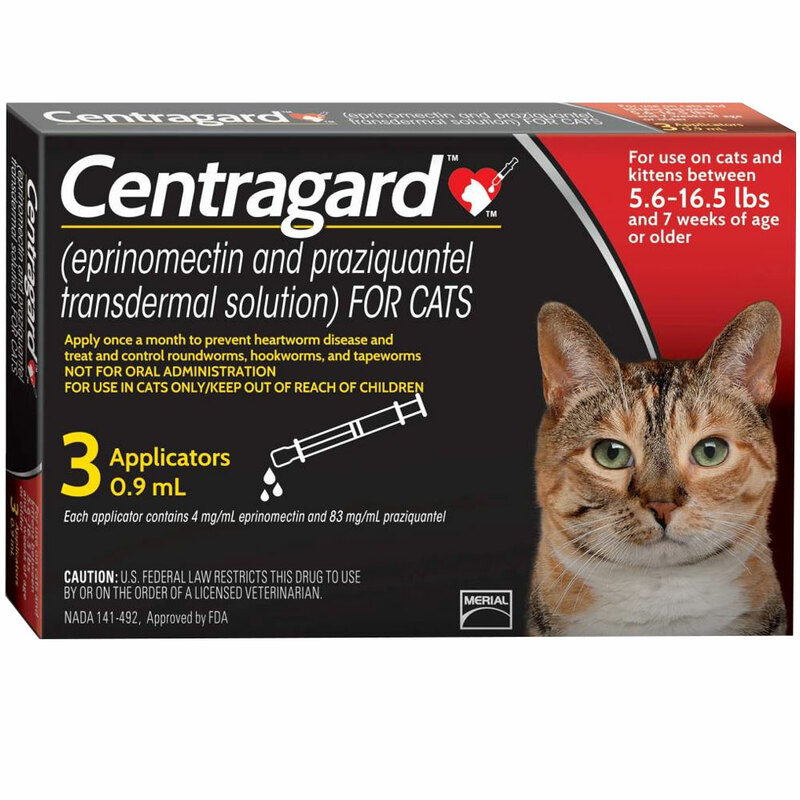 CENTRAGARD (eprinomectin and praziquantel transdermal solution) is for topical use only. Side effects may include vomiting, loss of appetite, lethargy, and hair changes and skin reactions at the site of application. If ingested, hypersalivation, vomiting, and lethargy may be observed. The safety of CENTRAGARD has not been tested in kittens less than 7 weeks of age or less than 1.8 lbs.